On Tuesday morning we get the chance to visit what is possibly the closest thing to a tourist attraction in Antarctica. Port Lockroy was (and still is) a British owned science station in the Gerlache Strait. As part of the British Government’s attempts to strengthen its claim on the site over Argentina and Chile, it established an official post office in 1944. 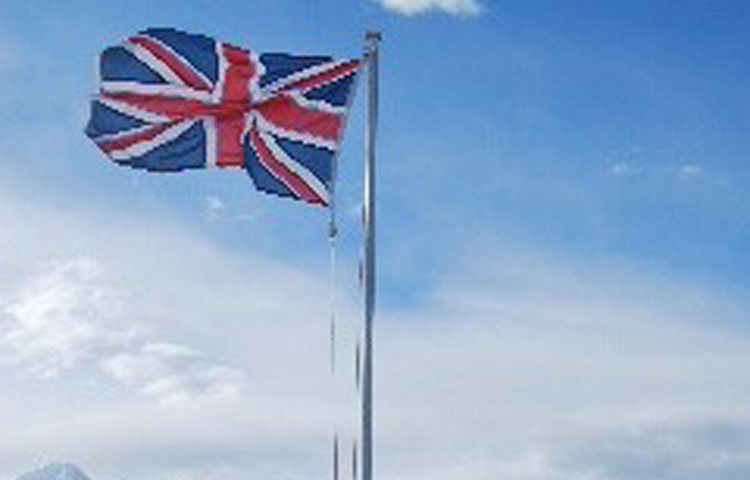 The site is now maintained by the Antarctic Heritage Trust who now use the funds raised from the sale and postage of post cards to maintain the site and small museum showing the lives of the early polar explorers. The inside of the station has been preserved as it would have been in the 30’s through to the 60’s, complete with rough bunks, sealskin mittens cans of spam, recipes for spicy seal brains on toast and, of course, a photo of Her Majesty. 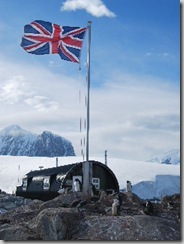 I have never been someone with a huge amount of nationalistic pride (bawling at the TV for Mo Farrah and Ellie Simmons aside) but I feel oddly stirred at the sight of the union flag flying aloft above an ancient nissen hut in a remote Antarctic sound – a living connection to our heritage as a nation of explorers (not to mention indiscriminate colonisers). At just over 66 degrees south we cross the Antarctic circle and have officially become polar explorers. The icebergs that, up to now, were dispersed widely across the waters, have now become more plentiful. We also encounter large sheets of flat sea ice that close together quickly to lock in unsuspecting boats, a fate suffered by Shackleton’s Endurance and many others. Our only casualty today arises when an Italian couple lose a grip on their iPad which goes plunging 2000 metres to the bottom of the Southern Ocean (which I’m pretty sure invalidates the warranty). We pass through narrow ice choked channels with sheer cliffs on either side rising a thousand feet into the air. It looks like an outtake from Lord of the Rings – with whales. When the pack ice becomes too thick we are able to disembark and walk around on it for a while. (Proud to report I made a snowman). The weather is close to perfect, with a brilliant steel blue sky and bright sunlight. High factor sun lotion is an essential as the hole in the ozone is all too real here. When we return to the ship someone has the bright idea of proposing a dip in the polar waters. Why is it that I could sit quite happily on my own next to a polar sea for weeks on end and not be even remotely interested in plunging into it in a pair of shorts. However, lay down a challenge, cast doubts on my masculinity, evoke the spirit of Shackleton and, shallow creature that I am, I will immediately push my way to the front of the queue in my skimpy’s crying ‘for England’ or some such inane rubbish. Some of my bravado deserts me when the lady in front of me emerges from the freezing plunge looking highly distressed and in need of a cardiac nurse (nearest one probably around 1500 miles away). Tension is raised still further when they attach me to a stout rope – presumably in case I go straight down and don’t stop. Suffice to say it was cold – mind numbingly, extremity contracting, get-me-the-hell-out-of-here-right-bloody-now, cold. I am pitifully grateful when two stout crewmen use the rope to pull me out, looking like a piece of frozen tripe from the cold food section in Waitrose. Declining the offered glass of vodka, I stagger away from the scene and spend the next half hour in a warm shower trying to coax my gentlemen’s baubles back into the daylight. The trick is to wash yourself with the water first… Before you immerse yourself in liquid hell my friend… However, awesome Allan… Just awesome.